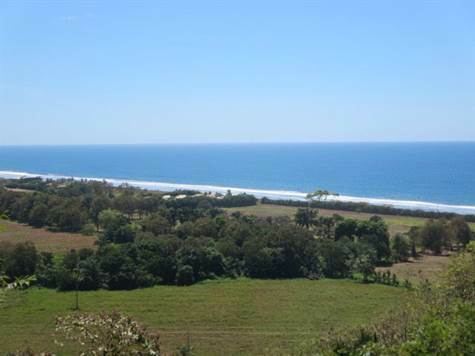 "AMAZING OCEAN VIEW CLOSE TO BEACH"
Excellent unobstructed panoramic ocean views. Paved roads, security gate, with 24/7 security, all utilities in place. The building pad is ready for you to start construction. This lot is 5000m2 in size. (1 &1/4 acres) Plenty of room to build your dream house with swimming pool and and outside entertaining areas for family and friends. Valle Perdido (Lost Valley community) is located outside the Costa Rican Central Pacific town of Playa Hermosa, just south of Jaco. Driving time is currently 1.25 hours to the San Jose airport. It's 5 minutes to the beach from the lot. The community includes Costa Rican tropical forest with several streams, providing the habitat for numerous plant and animal species. Completed infrastructure includes concrete roads and drainage, a security/maintenance facility, electric to houses, A private well provides water to the homes. Several parks and lookouts highlight the natural environment.